This year the Garden Club of Virginia celebrates 80 years of Historic Garden Week, a spectacular statewide event referred to as “America’s Largest Open House.” This year’s local tour, sponsored by Hillside Garden Club and The Lynchburg Garden Club, will be held Tuesday, April 23, from 10 a.m. to 6 p.m. Featuring beautifully appointed homes and gardens, historical sites, refreshments and activities galore…there’s something for everyone to enjoy during this much-anticipated event. Here at HOME, we are delighted to share a preview of the homes and gardens that await your discovery on Garden Day. 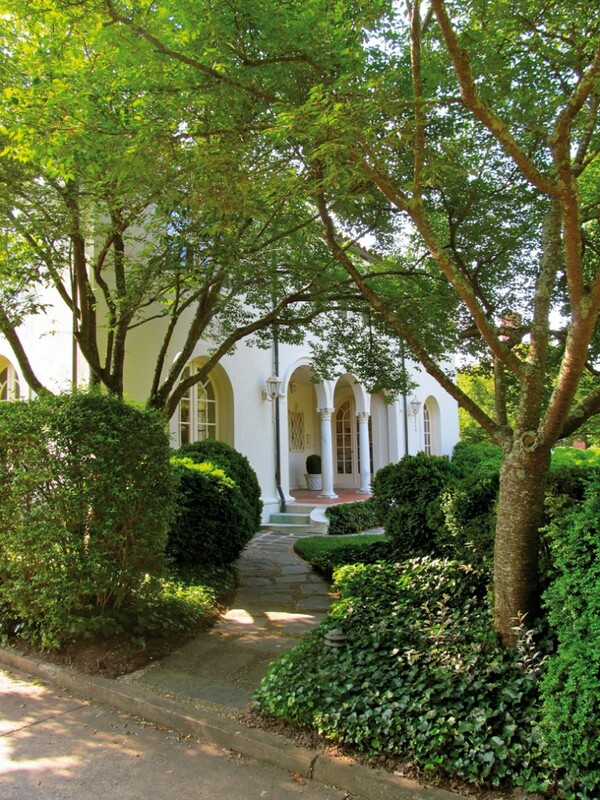 A stone pathway leads to the triple-arched loggia and entryway door made of gum tree wood and into a home (c. 1924) designed by architects Craighill and Cardwell, considered to be Lynchburg’s masters of period-house design. A first-floor addition dates from 2002. The dining room boasts hand-painted Chinese wallpaper. The owners run a statewide food service and catering business as well as a local cafe. The kitchen, a gourmand’s dream, reflects this passion and includes special features such as an antique samovar. The kitchen and family room share an open floor plan with columns defining the space and rich gray walls adding to the stately elegance. A painting by Roberto Ferruzzi of Venice hangs in the family room over the fireplace. The early-1900s Steinway piano has remained in its current location for over 80 years. It is flanked by two clerestory windows in the living room. The garden echoes the Mediterranean style of the home. Pea gravel walkways and boxwood lead to an Italianate fountain. Oak leaf hydrangea, espaliered little gem magnolia and climbing hydrangea are sheltered by a crepe myrtle canopy and the home’s original pergola. Open for the first time for Historic Garden Week. Rie and Eddie Godsey, owners. European linden and magnolia trees add structure to the front lawn. 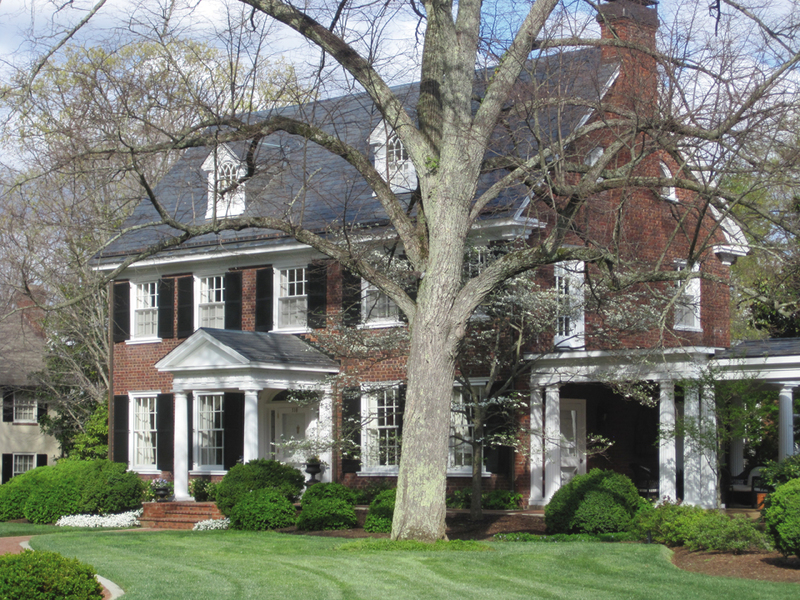 An adjacent living porch and a carriage house-style garage joined by a series of Doric columns finished with a slate roof create an attractive open-air breezeway. The year-round garden is filled with hydrangea, magnolia, maples and roses. The boxwood on the hill and the albelia grandiflora and rhododendron that border the living porch are original plantings dating to the late 1920s. The Pennsylvania bluestone patio offsets sloped lawns that continue into a dell containing cypress and hydrangea. The owners share a passion for both Eastern and Western art, reflected in their extensive collection which includes works by local artists. Noteworthy is a 2010 renovation of the kitchen. Open for the first time for Historic Garden Week. Dr. and Mrs. David Frantz, owners. A composition of outdoor urns and vines offset a white arched portico and a pair of Ionic columns that frame the entrance of this pale yellow Colonial Revival (c. 1924). The mullioned windows from the second floor lend natural light in the foyer, showcasing a large Impressionist oil painting by Santa Fe artist Deborah Gold. The oak staircase leads upstairs to the master bedroom, the nursery and the children’s bedroom. A recent renovation of the kitchen and family room is period-appropriate and includes the preservation of a bank of glass breakfront cabinets from the original butler’s pantry. White Carrera marble countertops, custom cabinetry and an intimate dining space with an antique French crystal chandelier are highlights of this transformation. 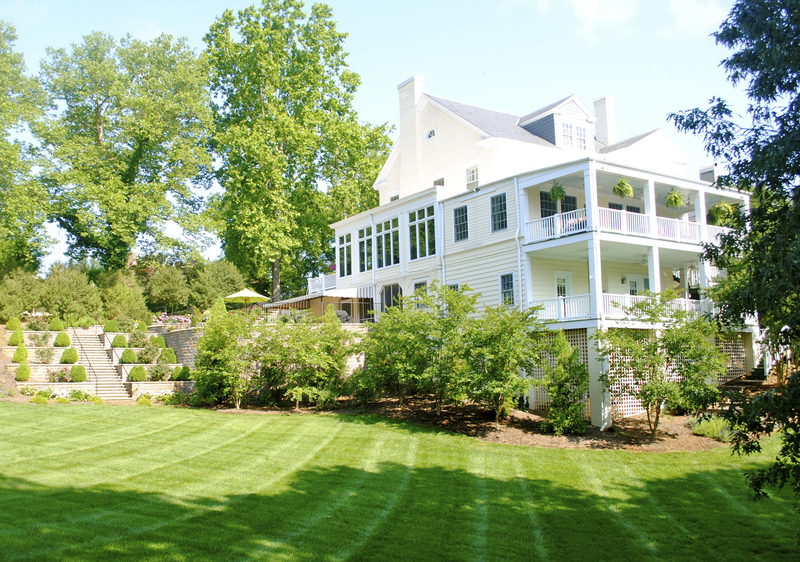 In 2009, an outdoor living space and terraced hillside garden was completed. Designed for continuous color and fragrance throughout the year, it includes roses, gardenias, peonies, hellebore, rosemary, lavender phlox, hydrangea and boxwood. Yoshino Cryptomeria and Nellie Stevens Holly create a natural fence along Rivermont Avenue, the bordering thoroughfare on this corner residence. Open for the first time for Historic Garden Week. 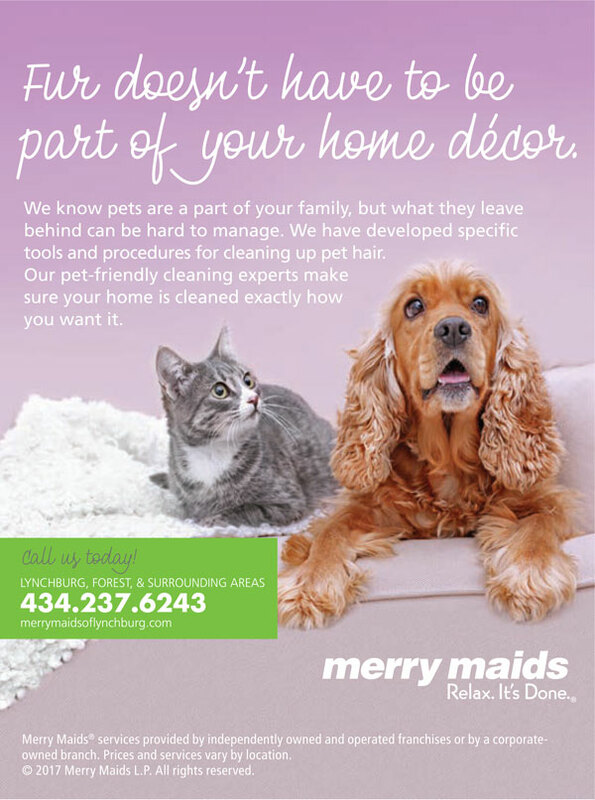 Dr. and Mrs. Thomas Meyer, owners. In 1813 Walter Dunnington purchased land from the family of John Lynch, the founding father of Lynchburg. Approximately 12 years later, he built a federal-style house on the parcel. 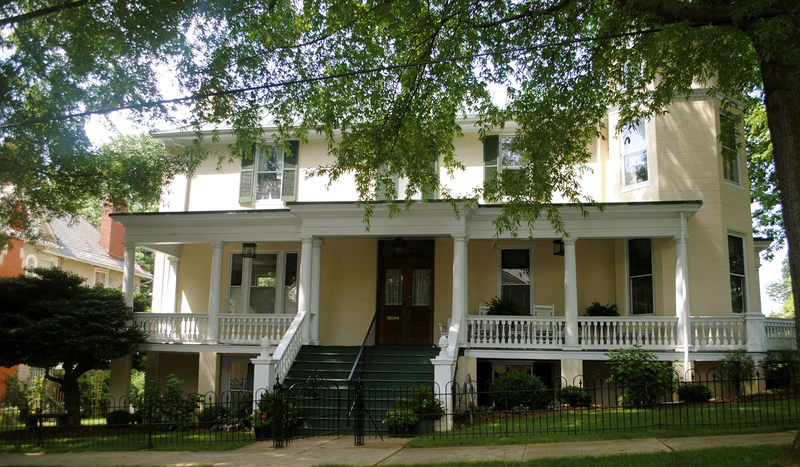 In 1851, Samuel Garland, Sr. purchased the house for his nephew, Samuel Garland, Jr., who later became Brigadier General of the Confederate States of America. The house was well-known for its hospitality during the young Garland era. Annexed into the city in 1870, Garland Hill (named after Samuel Garland, Sr.) is one of the original seven hills upon which Lynchburg was built. The Garland family added the distinctive polygonal tower. In the first-floor study, the signature of H. Garland (a descendant of Samuel Garland, Sr.) is etched in a windowpane, which is still visible today. The house remained in their family until 1901 when it was enlarged and updated by James B. Noell. Today, the Dunnington-Garland-Noell House exists as a Queen Anne Victorian with porches that overlook rose bushes, original plantings and a new garden. In 2008 the current owners began a two-year restoration which preserved the original ground floor kitchen (c. 1825) and restored the home to its original grandeur. Of note is the large portrait by Peirson Ricks (1908-1950) whose book, The Hunter’s Horn, is also on display. Open for the first time for Historic Garden Week. Anne Taylor and Joe James, owners. Towering deodora cedars and American boxwood border a pea-gravel drive lined with cobblestone that leads to the garden. The backdrop is a turn-of-the century home referred to as the Early House, built by relatives of General Jubal A. Early, who served under Stonewall Jackson and then Robert E. Lee. The aged flagstone terrace acts as a bridge to the informal spring garden that is designed as a series of garden rooms. The owners have worked on this effect for three decades. Each “room” includes a variety of plantings. Fragrant daphne, edgeworthia, hellebore, maidenhair fern, tree peony and wood poppy are abundant. There is a fountain that feeds into a small pool, as well as garden vessels tucked in amongst the plantings and a bird bath. The space includes several raised-vegetable beds, as well as mature Cedar of Lebanon, copper beech, evergreen and deciduous magnolia. 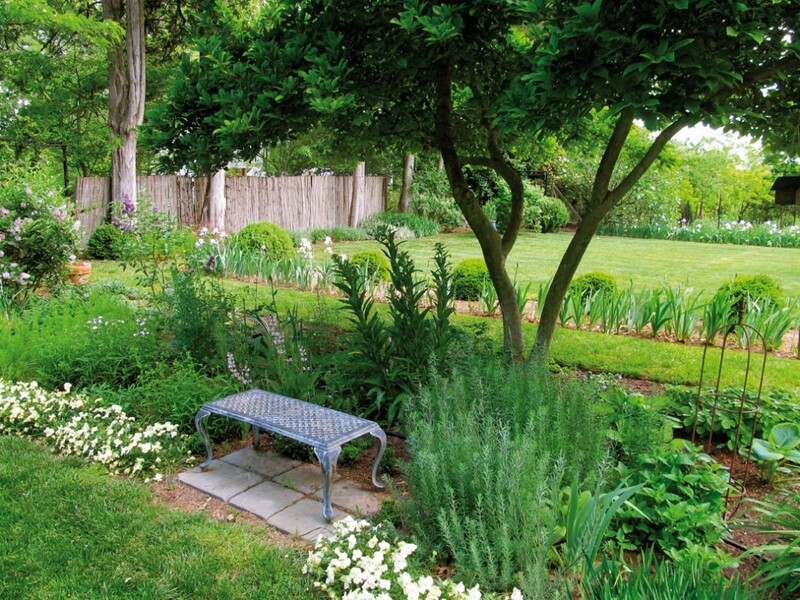 Boxwood and hand-hewn bamboo fencing lend structure to this enchanting garden. Toni and Jim Piggott, owners. The owners fell in love with this site that was once home to the Rivermont Corporation Quarry, which closed in the early 1930s. 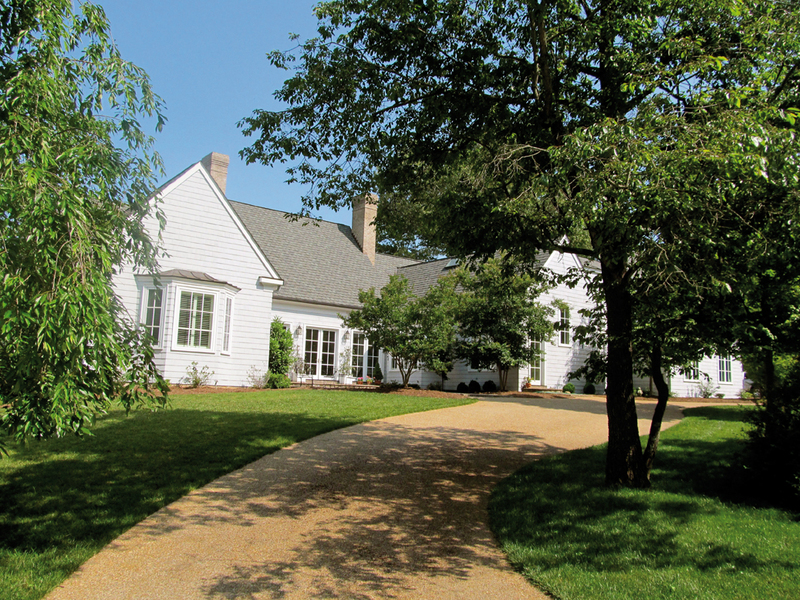 Modeled after their previous home, this French Country-style home was completed in 2009. A terrace leads through a set of French doors into the white-beamed living room featuring a vaulted ceiling and dual fireplaces. Here a collection of porcelain that belonged to the owner’s great-great-grandmother is on display. The den reflects the couple’s affinity for the West. A Joan of Arc sculpture made of cypress root by Pierre Daura sits on a console table, juxtaposed by a chair that belonged to Wade Hampton, a general in the Civil War passed down to his great-great-grandson, Mr. Davis. Comfortable furnishings complement both the antiques and local artwork by Purnell Pettyjohn and Sarah Wilson Saunders. The kitchen has white wooden floors and sketches by Queena Stovall. The living room and den open on to a screened porch with views of the preserved quarry. Jane and William Davis, owners. Other places of interest open during Garden Day include Sweet Briar House, Old City Cemetery, Miller-Claytor Gardens, Point of Honor, Quaker Memorial Presbyterian Church, Poplar Forest, Sandusky, the Anne Spencer House and Garden Museum, and Awareness Garden. Several of these sites have benefitted from Garden Club of Virginia’s efforts. For more information about these sites, see vagardenweek.org/guidebook.cfm.